Next spring I’ll have three tiny new bushes in the same flowerbed with larger existing ones, which will look peculiar at first; but I expect it won’t be long before they grow big enough that I can’t tell the difference! That’s often how things go. Even if something happens that is bad luck and a nuisance, there’s no reason to get stressed about it because in a year or so, it will all be forgotten. Hi Elizabeth, glad your rose recovered, and thanks! Look forward to seeing them … the summer was hard on all of mine … I had to cut back on all of them. Hopefully, they will spring forth with new growth and buds in the Spring!! Thank you for sharing with Nurturing Thursday! Yes, it got very dry toward the end of the summer, I used a soaker hose to water my roses because the ground was so dry that even the weeds looked droopy! I expect a better spring, too. 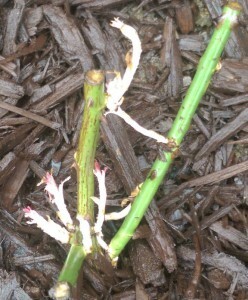 Thanks Claire — yes, they do need regular pruning, even though it looks brutal. I neglected to prune mine in 2013 because I got distracted doing other things, and then I wished that I’d paid more attention when I ended up having to cut off huge heaps of dead stuff after the cold winter!